Chris Trevino. Photo by Sarah Bird. 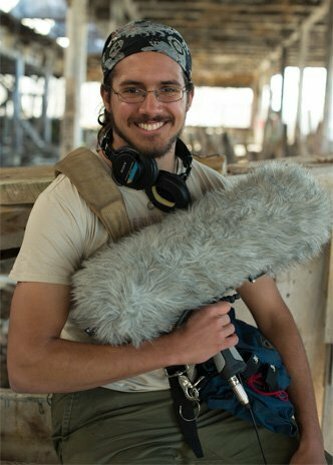 A sound design student orchestrates the clamor and creak of the zombie apocalypse. Chris Trevino brings life to the undead, whooshes and whams to super-heroes and villains. He sets the scene for every noisy medium imaginable, from video game to vlog to TV show. And as an up-and-coming sound effects producer, he’s got one of the coolest (and sometimes sloppiest) jobs around. Read more at Michigan Tech Magazine Fall 2014, by Danny Messinger. Anne Beffel (department chair, Visual and Performing Arts) has exhibited integrity in the face of significant challenges often associated with change processes. As of Dec. 20, she will assume her faculty appointment with a research focus in areas for which she is nationally recognized: public art; social sculpture; and mindfulness in creative processes and well being. She will begin work on a recently awarded collaborative public art project focused on the Duwamish River, a Superfund site in Washington. Jared Anderson (associate professor, music) has agreed to serve as interim chair of the department. Performances for Antigone will be February 19-21 and 26-28, 2015. Performances for The Producers will be April 9-11, 2015. The Rehearsal schedule may vary but most rehearsals will be Sunday–Thursday, 7:00-10:00 pm. A finalized rehearsal schedule will be sent out after auditions. *You must be 16 years of age or older to audition. Familiarize yourself with the audition material so you understand the plot and characters. Antigone is chronologically the third part of the Oedipus Rex Trilogy which tells the story of Antigone, the daughter of Oedipus, after her father’s death. The story opens at the end of a battle between Antigone’s brothers, Eteocles and Polyneices, for control of Thebes. Both brothers died in the battle, but Creon, the new king of Thebes, has declared that while Eteocles should be buried with honors Polyneices body should be left unburied. This is a severe punishment for Polyneices since the Greeks believed that one could not go to the afterlife unless one’s body was properly buried. Since she loves both of her brothers, Antigone decides to bury Polyneices in spite of Creon’s order and tries to enlist her sister, Ismene, in the task. Ismene refuses to break Creon’s law. Antigone says the law of the Gods is more important than mortal man’s law. It is ironic that just as Antigone is burying her brother, Creon comes on stage declaring that anyone caught doing so will be put to death. When Antigone is caught burying her brother, she makes no apology, declaring that she is only doing what is right. Creon is a proud man and no amount of convincing will make him change his mind. The plot thickens as it comes out that Creon’s son Haemon is engaged to marry Antigone. He tries to use reason to convince his father that killing Antigone for burying her brother will make him unpopular and hurt his rule. Creon accuses his son of disloyalty and sends Antigone to be locked in a cave with only limited food and water thus sending her to her death. Finally, Teiresias, the blind prophet who foretold the tragedy of Oedipus, arrives and manages to convince Creon to change his mind by foretelling of the deaths that will come from this Creon’s action, but it is too late. When they get to the cave, Antigone is already dead, a suicide. Haemon also commits suicide and upon learning of her son’s death, Eurydice, wife to Creon, follows her son’s example. Creon is left with nothing but his kingship He had put his pride and his power ahead of his family and angered the gods. Although he kept his kingship it was poor consolation for losing both his son and his wife. The Producers is based around the character of Max Bialystock, a down and out Broadway producer whose latest work flopped on opening night. Max, plagued by his former success and scrabbling to stay afloat, experiences a change in fortune when downtrodden accountant, Leo Bloom, discovers there is money to be made in Max’s theatrical failure. As a result, the two formerly defeated business men form an unlikely union with the goal of creating the world’s worst musical. The plot develops as the duo enlists the help of ridiculous and often farcical characters on the way such as former Nazi and on-going Third Reich enthusiast Franz Liebkind, Ulla the blonde bombshell secretary/receptionist and the flamboyant homosexual director Roger De Bris. As a result of the characters combined brainpower and ludicrous behaviour Spring Time for Hitler is born in Broadway. 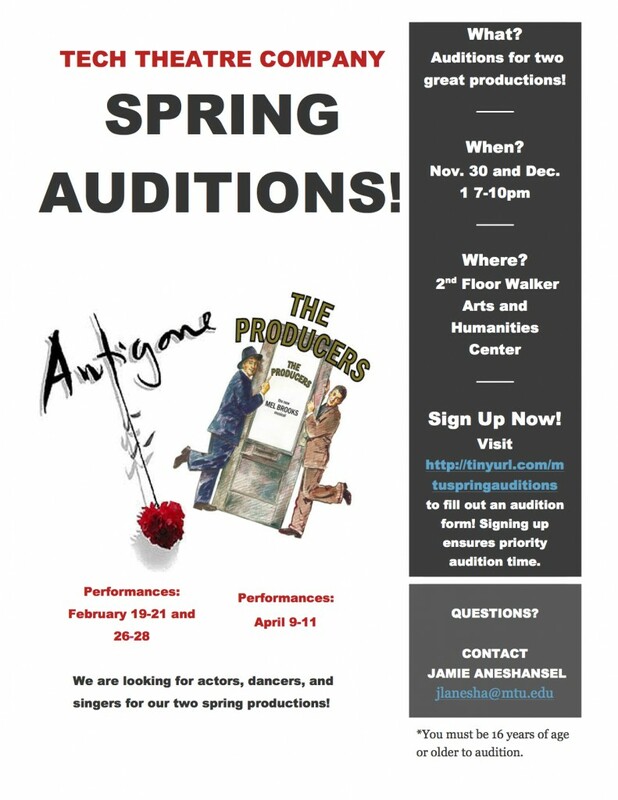 The Department of Visual and Performing Arts is holding auditions for two plays, “Antigone” and “The Producers,” on Sunday, Nov. 30, and and Monday, Dec. 1, from 7 to 10 p.m. each night, on the second floor of the Walker Arts and Humanities Center. Performances for “Antigone” will be Feb. 19-21 and Feb. 26-28, 2015. Performances for “The Producers” will be April 9-11, 2015. Students, faculty and community members are welcome to audition. To audition for a part in either play, sign up using the Google Form to receive audition material and to ensure priority audition time. After filling out this form, you will receive a contact and information form to fill out, as well as all audition material and what to expect at auditions. You are welcome to audition for one or both plays on the same night. For more information, contact Trish Helsel at helsel@mtu.edu. Sandy Shaw ’76 tells us about Snow Memories: The Pep Band Performance that Wasn’t in the November 18, 2014, issue of TechAlum Newsletter. The Keweenaw Symphony Orchestra will present a free fall music recital on Thursday, Nov. 20, at 7 p.m. at Portage Lake United Church (PLUC). This recital’s theme, “Night at the Movies,” invites beautiful and compelling vocal and instrumental music, including performances of opera arias and art songs, a woodwind quartet, a string quartet and a premiere of a new composition. Though tickets are free of charge, a $5 donation toward the KSO and PLUC will be accepted at the door. A reception will follow the performance. Lisa Johnson joins the Department of Visual and Performing Arts from the Iowa Lakeside Laboratory. Johnson received an MFA and an MA with a focus in sculpture from the University of Iowa. Johnson has been involved in projects like Place-Map-Place, Trench(era), The Eva Luna Project and Kotcich. She also has experience with digital, audio and video production; performance development; woodworking; figure modeling; plaster casting and mold making; and papermaking.